Designed to comfortably sit two people, you can enjoy the summer evenings with family or friends in the relaxing surroundings of your garden. A spacious storage box is also included as a practical solution to storage of any necessities, whether they're gardening tools or entertaining essentials. Complete with decorative trellis, you can create a secluded fragrant haven by adding your favourite perfumed rose bushes or scented climbers to cover the panels. The Hampshire Arbour features pressure treated and FSC® Certified wood and comes with a 10 year guarantee against rot, which means its strong, durable and can be used year after year. Dimensions: 1.97m x 0.63m x 2.06m, assembly required - This product is 2 person assembly. 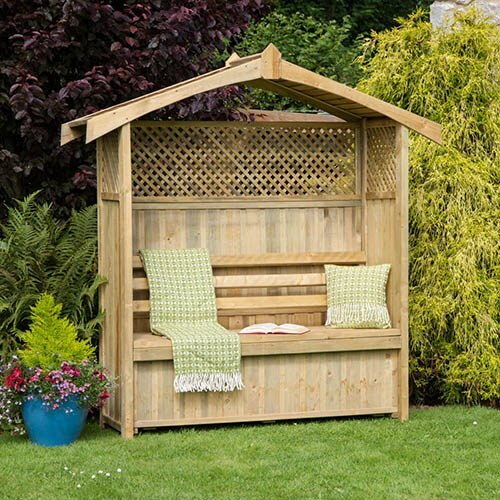 The Hampshire Arbour is the largest in the Zest 4 Leisure collection standing at 1.97m wide and 2.06m tall. Although large, the arbour's natural wood finish and delicate design mean it will fit perfectly in any garden arrangement. Designed to comfortably sit two people, you can enjoy the summer evenings with family or friends in the relaxing surroundings of your garden. A spacious storage box is also included as a practical solution to storage of any necessities, whether they're gardening tools or entertaining essentials. Topped by a beautifully functional roof, you can sit out whatever the weather, and as the arbour incorporates decorative trellis, you can created a secluded fragrant haven by adding your favourite perfumed rose bushes or scented climbers to cover the panels. Suitable for any style garden, the Hampshire Arbour features pressure treated and FSC® Certified wood and comes with a 10 year guarantee against rot, which means its strong, durable and can be used year after year.